Visitors with just one day to explore can see more in less time with this full-day private tour to top attractions in Giza, Sakkara, and Egypt's ancient capital city of Memphis. 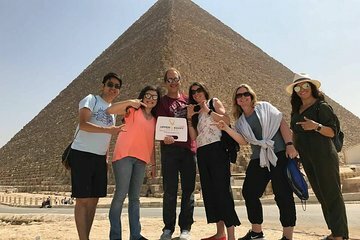 After convenient hotel pickup, let your Egyptologist guide lead the way to the pyramids at Giza, the Sphinx, and stepped tomb. Choose to explore inside the pyramids—at your own expense—or enjoy a camel ride and lunch, included. Head on to Sakkara to visit see Egypt's oldest pyramid, and see the fallen statue of Ramses II in Memphis.